Now that we have programmed our character to move ahead (yeah, it's just an illusion, but nobody can know it except you, I hope), we will add some powerups and snags. On collecting the snags we will benefit and on collecting the latter, it will be the opposite. Download the assets from this link. Import this custom package into your project by navigating to Assets->Import Package->Custom Package and selecting the package you downloaded. Once you import this package, you will notice that the Prefab and Material sub-folders are added to the Assets folder. If you click on the Prefab folder you can see that there are two prefabs named Obstacle and Powerup. The obstacle as you can see is a Banana fruit, on collecting which, our Player will gain energy and the other being an Alcohol bottle, on drinking which, as study suggests, the energy of our player would drain. The two important things to notice are the Collider and the Rigidbody. 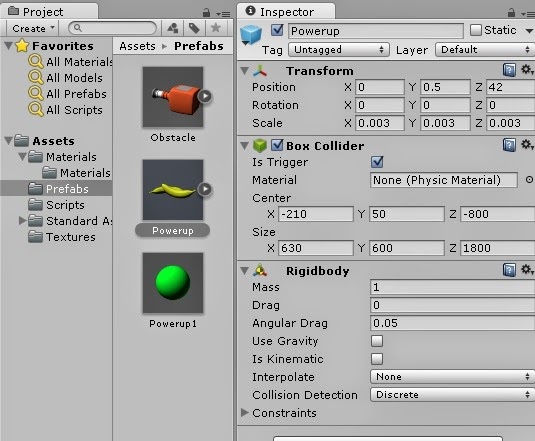 "Adding a Rigidbody component to an object will put its motion under the control of Unity's physics engine. Even without adding any code, a Rigidbody object will be pulled downward by gravity and will react to collisions with incoming objects if the right Collider component is also present." is a quote from the Unity Documentation. I believe that is simple enough to understand why the two components are used. IsTrigger: On checking this the field, the collision doesn't actually take place, instead it sends a message when the rigidbody enters/exits the tirgger based on the type of event used. Gravity: This field is unchecked as we do not want the gravity to play a role on these prefabs. If you drag and drop this prefab onto the Hierarchy, and double click on the prefab in the hierarchy to note its position (Do not forget to delete the gameobject from the hierarchy once you examine them). The script starts by defining references to the two prefabs(Powerup and Obstacle). The other variables are defined to control the timing and order in which the prefabs are spawned. Higher the value of spawnCycle, larger the time between spawning of the prefabs. The bool variable spawnPowerup is used to spawn Obstacle and Powerup prefabs alternatively. In the Update() method, the elapsed time is incremented and then the time at which the new objects are to be spawned is determined. The if else condition checks what object is to be spawned. We also determine the position at which the objects are to be spawned. Only the x co-ordinate is included in a Random range function as we need a static y and z values. The parameters in the Random.Range indicate the min and max value of x co-ordinate within which the random number is to be generated. Further we decrease the value of the timeElapsed so as to maintain the time between spawning of objects. (Note: comment out this line and see the difference). And finally we flip the bool value to spawn the other kind of object the next time around. Create an empty GameObject and name it as as GameController. This will be a container of the scripts that do not require any object to be attached to. Attach the SpawnScript to this empty GameObject. Create a new C# Script and name it as PowerupScript. Attach the file to the Powerup in the Prefab folder under Assets add the following code and save it. The above lines of code basically moves the Powerup i.e. the Banana fruit in our case, towards the Character, which for the player playing the game feels as if he is moving towards the Banana. Create another script named ObstacleScript. Add the below code and attach it to the Obstacle prefab. Note that in the case of the obstacle we have Translated towards the y-axis, this is based on the rotation axes of the prefab/object. Manipulate the axes and check out the differences. Now test this game by pressing the Play button or using the shortcut ctrl+P. You will notice that the banana and Alcohol bottle are being spawned randomly and are moving towards you i.e. you are moving towards them. It simply means that the spawnscript has two gameobject reference variables named Obstacle and Power up. And you need to assign value for these variables in the inspector. Values here are the prefabs obstacle and power up which we created and saved in the prefabs folder. Hope this made it clear..
#sujit i added a curly bracket at the end and now its working well thanks! First of all i must thank you for your very detailed and helpful tutorials. But the problem is only the powerup is moving towards the player but not the Obstacle. Any help would be great.Thank you. If the Powerup is moving then I don't find any reason why the obstacle should not move as we have used identical steps for both of them. Please try following the tutorial again and let me know if you still face the same issue. I got it sorted out. But now the problem is despite of the snags & power ups the game time remains constant ie.gradually the time is descending from 10 to 0. What did you fix to get the obstacle and power ups to move toward the player? Can anyone tell me why my items are spawning in the sky instead of the ground? and my character is not moving toward them. I did exactly what it said in the steps. Fixed it. Does anyone know how to replace the actual images? Like if I want the whiskey to be something else and the banana? How do we customize these images? 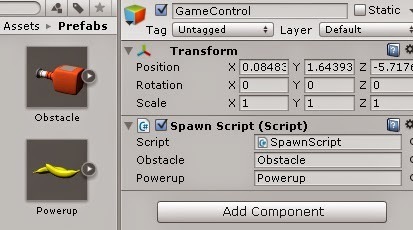 Add the script to the respective prefabs that we have created i.e., obstacle script to the obstacle prefab and the powerup script to the powerup prefab, both of which are saved in the Prefabs folder under assets, if my memory serves me right. 1. You have renamed the script, check the name of the script in the Assets folder and the name of the class in the script. Make sure both of them are the same. 2. The script on the prefab (which could be the powerup or the snag/obstacle) is missing and you got to add it again.to the prefab. The snag for reason is my powerups and obstacles arent moving. I've checked the script and theres nothing wrong with it, I checked scale and there should be no problems. I'm using my own custom assets for the job but everythoing works except the movement as i have checked the references. Hope you can help, cheers mate. Not sure what exactly could be the issue, try attaching the script which you are using to translate the obstacle and powerups to something like e cube or a sphere perhaps and see if that works... Or even you could try this for your custom gameobjects in a new scene which has only the custom gameobjects and nothin else, add this script to it to see if it moves.. Sometimes unity fails to work with the prefabs in some scenes, so maybe try that in a new scene and let me know if this helps. Hi um, I can't access the powerup/obstacle download because it says "This link has generated too much public traffic, link temporarily shut down" can you post a new link or something like that? The link has been updated now..
Um when I try to put the script onto the GameControl thing it says " 'SpawnScript' does not exist" Help? oh, and say I didn't want it to banana or alcohol how would I change this? Hi sir I have this problem when I test my game. I get this error "MissingReferenceException: The object of type 'GameObject' has been destroyed but you are still trying to access it.". could you tell me how to fix it? thank you. i have write some code that instantiate some objects using C# in android platform but there is an issue that when there is instantiating objects the Android device hangs until the code runs when instantiate completes then the game runs normal .......... can anybody tell me that why the game hang when instantiate objects????????? How can I move the snags and powerups in in my desired position? How can I move the snags and powerups in my desired position? Need a clarification, both the script (Obstaclescript and PowerupScript) works fine when i crate it under prefabs folder. When i create the same script under script folder and tagged it to corresponding prefabs its doesnt work. only first two object created dynamically moves towards the player, rest of the objects are created statically far away from the player and it doesnt move! Please help me to understand it!! thnx in advance! I want to spawn objects more far, how can I do it?